Monday November 30th 1896 I worked all day with the lard and meat. Will helped me some a very cold day. Leonard came to husk corn. Tuesday December 1st 1896 This is Otts birth-day. I was at home at work all day. I did baking and sweeping. Will helped husk corn. 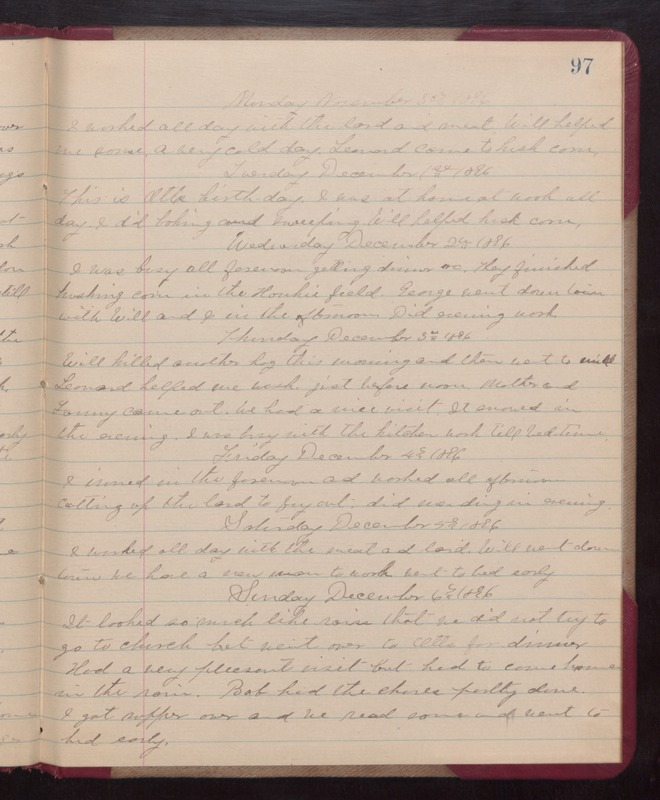 Wednesday December 2nd 1896 I was busy all forenoon getting dinner &c. They finished husking corn in the Hankie field. George went down town with Will and I in the afternoon. Did evening work. Thursday December 3rd 1896 Will killed another hog this morning and then went to [milk?] Leonard helped me wash. Just before noon Mother and Fanny came out. We had a nice visit. It snowed in the evening. I was busy with the kitchen work till bed-time. Friday December 4th 1896 I ironed in the forenoon and worked all afternoon cutting up the lard to fry out, did mending in evening. Saturday December 5th 1896 I worked all day with the meat and lard. Will went down town we have a new man to work. Went to bed early. Sunday December 6th 1896 It looked so much like rain that we did not try to go to church but went over to Otts for dinner. had a very pleasant visit but had to come home in the rain. Bob had the chores partly done. I got supper over ad we read some and went to bed early.